This super-easy dinner makes the most of last-of-season summer produce. But don’t be fooled – this dish can be enjoyed any time of year. Grocery store cherry tomatoes usually the most flavorful, even in the heart of winter! 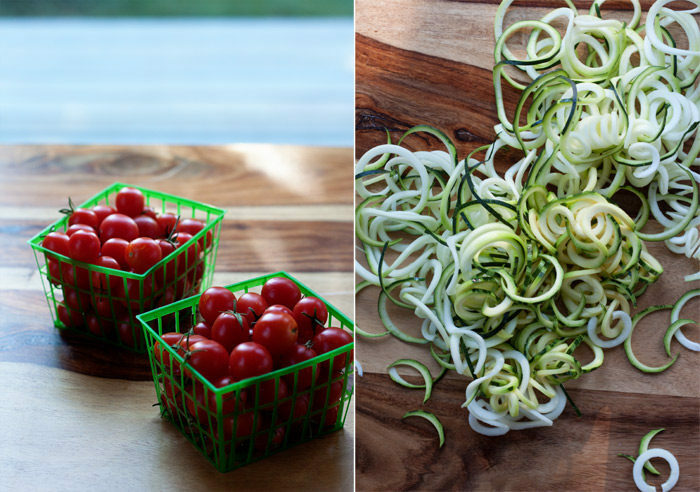 I’ve been experimenting more with spiralized zucchini this year, and as you can see, I’ve been loving the stuff. Better late than never trend-wise, eh? Cherry tomatoes, on the other hand, have been a love of mine for awhile. So when I first saw this video on the Serious Eats Facebook page, I practically tripped over the dogs and the cats on my way to the kitchen in order to make it pronto. Okay, I may actually have tripped over the dogs and the cats – with two of each, they’re everywhere! So this sauce. It’s so very simple. 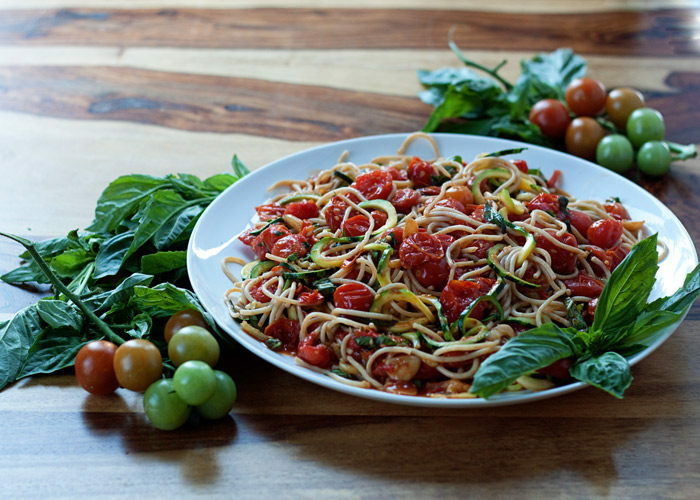 Basically, you saute garlic in a good bit of olive oil, then you add the cherry tomatoes. Cook, cook, cook until they burst, and all those wonderful juices form a lovely thick sauce. 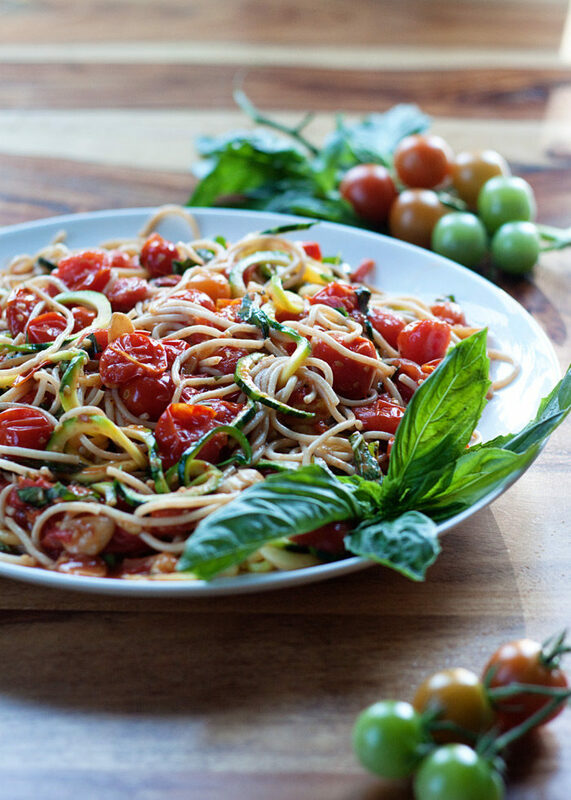 Add a handful of fresh basil and some salt and pepper and you have a pasta sauce in as much time as it takes to boil pasta. Talk about an easy late summer dinner. 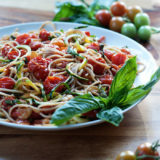 So there I was – obsessing over zoodles, cherry tomatoes, and that video and well, sometimes the dinner ideas just make themselves! Not literally, of course – but how cool would it be if dinner just made itself? I can’t be the only busy mom who has fantasized about this. Perhaps dancing spaghetti and self-stirring sauce would be a little disturbing, but so worth it. Oh so worth it. 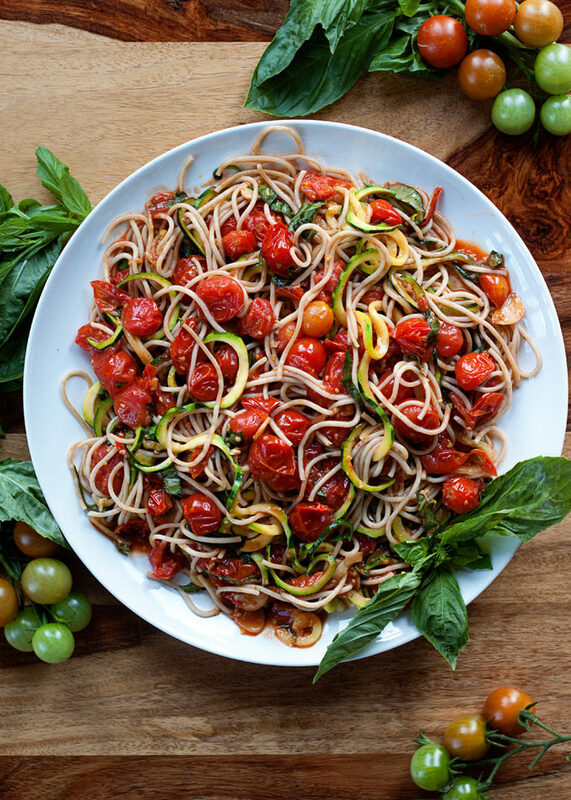 My points – and there are many of them, lord – is that this Zoodles & Noodles with Burst Cherry Tomato Sauce was born out of many current obsessions plus a very real need to have dinners that make themselves (I can’t move past this concept). But the fact is, this recipe kind of practically does make itself. (In other words: super easy). 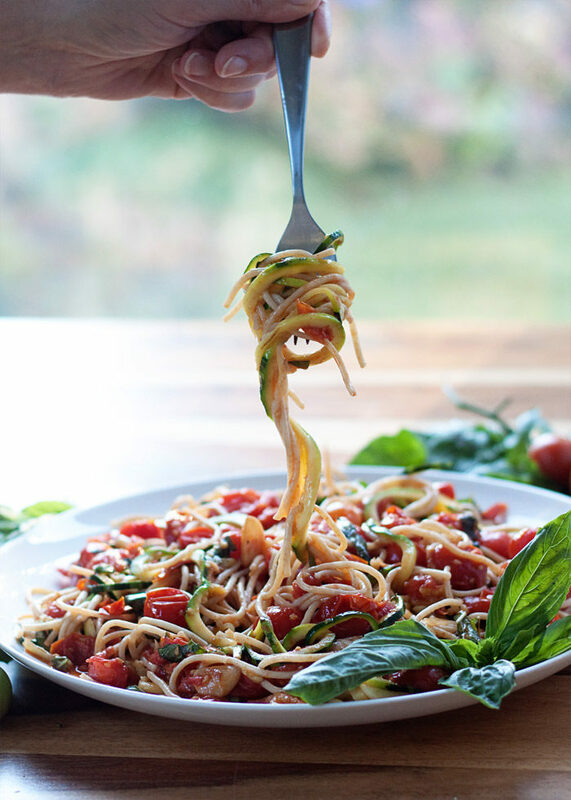 I love mixing zucchini noodles with pasta – it makes a dish much lighter than if it were made with 100% pasta, but heartier than if it were made with zucchini only. Win-win! Note to my garden: Please oh please hang in there a few more weeks, will you? Because I can’t get enough of this super-simple dinner. Set a large pot of water over high heat. Bring to a boil. Add a generous pinch of salt and toss in the pasta. Cook until al dente according to package instructions. Reserve about 1/2 cup of the cooking liquid then drain in a colander and set aside. While the pasta cooks, set a large skillet over medium heat. When hot, add 1 tablespoon olive oil. Add the spiralized zucchini along with a pinch of kosher salt and cook, stirring frequently, until just tender, about 3 minutes. Transfer to a plate. Return skillet to the stove, again over medium heat. Add 1/4 cup olive oil and the sliced garlic. Saute garlic until just golden and fragrant, about 30 seconds. 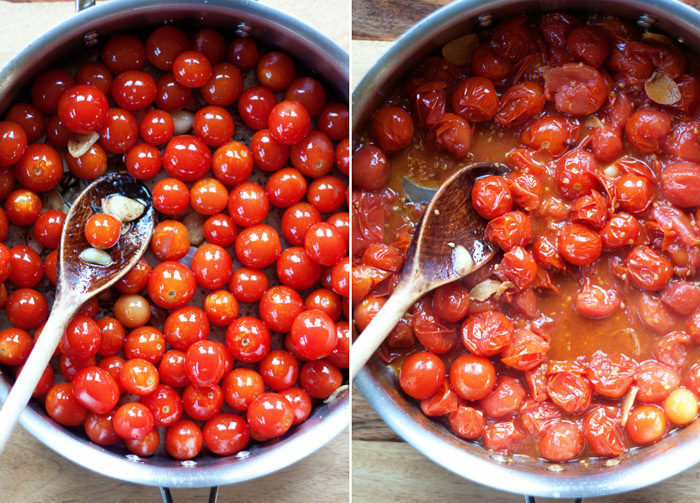 Add cherry tomatoes, 1/2 teaspoon salt, and 1/4 teaspoon black pepper. Cook, stirring occasionally, until most of the tomatoes have burst and a thick sauce has formed, about 12 minutes. When the tomatoes start to soften, you can smash them with your cooking spoon to help them along, but most will burst on their own. Stir in the basil. Taste sauce and add additional salt and pepper if desired. 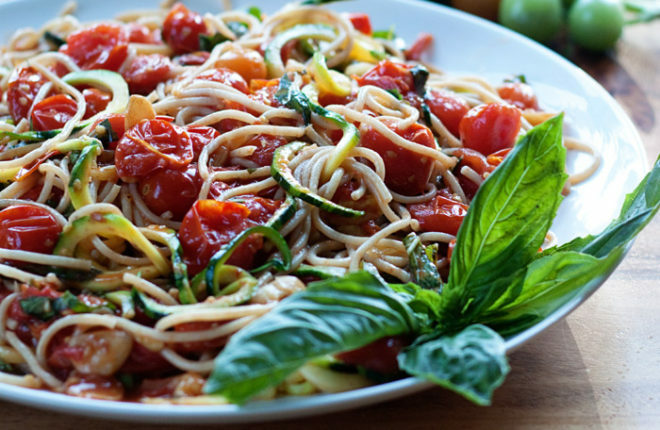 Add zucchini noodles and pasta. Toss until well-coated, adding a bit of the cooking liquid at a time if the sauce seems to need some thinning. Garnish with additional basil, if desired. Serve. Pass shaved Parmesan Reggiano at the table for topping, if desired.